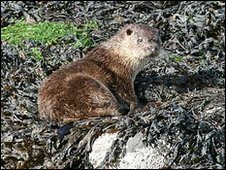 A Scots fishing village made famous by the children's TV programme Balamory is to honour Elvis - a wild sea otter. The friendly mammal with the famous name was found dead under an upturned boat in Tobermory, on the Isle of Mull. During his lifetime, Elvis had become a local celebrity and was a favourite attraction with tourists. Mull's Sea Life Surveys has set up a memorial fund for Elvis and a local councillor has called for a statue to be erected in his honour. Helen Chalmers, who runs a bed and breakfast in Tobermory, told BBC Radio Scotland that Elvis became famous for "his ease" around people. "Elvis seemed to be particularly comfortable with people watching him and was quite happy pottering about the main street of Tobermory with the tourists and the locals," she said. Mrs Chalmers said the otter was given his name as his hair was always "slicked back" and "he was a bit of a performer". She added: "I've spoken to some wildlife experts and they say that when one (otter) passes away then the territory is open for another to come along and take their place. "Maybe he's left some baby otter that might come along and fill his shoes."